Rated PG-13 for thematic elements and brief violence. For a movie that mines its most startling jolt out of the concept of time, there is a knowing and ironic sense of timelessness to Alice Rohrwacher’s exquisite pastoral fable “Happy As Lazzaro.” When it unassumingly gets underway in its dimly lit, intimate opening minutes unfolding inside an overcrowded rustic kitchen, you almost mistake it for a tale set in a different century. Rohrwacher, who previously explored similar themes around the clash of the countryside and the urban with “The Wonders,” throws you right inside of a mostly dilapidated house somewhere in rural Italy, occupied by generations of people in stained cotton and linen. Slowly, she folds in a method to their madness, where there is only a single light bulb to go around, youngsters are expected to consult and respect their elders and a sense of order, for better or worse, keeps their world intact. We still aren’t exactly sure what year it is—although we’d spot some flip phones later—when she turns our gaze to the angelic face of Lazzaro, played by the perfectly cast newcomer Adriano Tardiolo in a mostly quiet, deeply melancholic performance. So palpably innocent Lazzaro’s wide eyes and frank smile are that they immediately suggest a kind of ageless purity; one that would be out of place in any era, not just the unpronounced one Rohrwacher dips our toes into before she veers her tale into a dreamy, almost ghostly territory. In that, Rohrwacher is quick to confirm Lazzaro’s delicate status in the tiny village of Inviolata, amongst a clan of slave workers who break their backs for the notoriously abusive landholder Marchesa Alfonsina de Luna, also known as the “Queen of Cigarettes.” On top of being the person who doesn’t say much at all, we come to understand that Lazzaro is also the agreeable guy who can’t turn down the demands of his people. So he pleasantly runs around for his peers—out of decency, not gullibility—bringing coffee to those who ask and infusing the air with a naïve quality. Soon, his affability draws the attention of a young nobleman, the rebelliously spirited Tancredi (Luca Chikovani), who is vocally repulsed by his family’s unlawful and morally bankrupt ways. Impeded by his own cowardice nevertheless, Tancredi gets Lazzaro to consent to a strange agreement and schemes his own kidnapping in the hands of the peasant. Guided by friendship, duty and loyalty, Lazzaro agrees, unknowingly leading the way to an unspeakable tragedy. Or perhaps not. 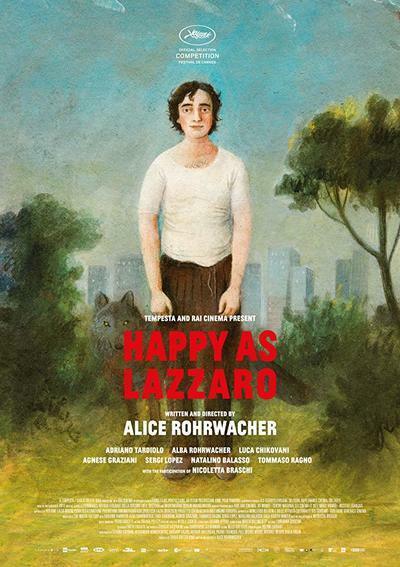 Shifting its shape into the above-mentioned supernatural terrain from this point on, “Happy As Lazzaro” becomes both an increasingly allegorical study of the Italian class divide, and a challenging film to write about without giving away crucial spoilers. In that, it should be sufficient to identify Lazzaro’s resulting journey as a spiritual time-travel that introduces a mystery akin to the twist in Olivier Assayas’ “Clouds of Sils Maria.” In the second part of her film, Rohrwacher navigates an Italian city in the near future (the exact year is still unidentified) through the soulful eyes of a lost and cold Lazzaro, who calmly searches for his family and dear friend Tancredi. When he finally finds his tribe, we notice it isn’t just aging that changed his people. Now free from the enslavement of Marchesa but trapped inside another cycle of poverty and societal oppression, Lazzaro’s people scrappily and secretly live in a water tower-like space and make ends meet by any means necessary out of desperation. Elevated by gentle humanist touches and Hélène Louvart’s otherworldly cinematography at every turn, “Happy As Lazzaro” toys with the idea and image of a wild and dangerous wolf, that stands in as a divine, fairytale-esque metaphor for power. While it renders a touch heavy-handed in the film’s final act when Lazzaro hastily tries to put his fairest foot forward amid a world ruled by merciless capitalism, Rohrwacher still manages to pack an undeniably poignant punch with the simplest of questions: in a world defined by helplessness and social injustice, how far would one get by instincts of basic decency alone? Easily among this year’s finest films and laced with an unapologetic social message, “Happy As Lazzaro” dares one to imagine a reality where each individual would task themselves to be as selfless and morally whole as its main protagonist. If only.